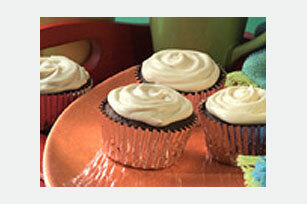 Make these Java Mini Cakes for your mocha-loving family. This easy recipe features the delicious combination of chocolate cake mix and coffee. Prepare cake batter as directed on pkg., substituting equal amount of coffee for the water. Spoon evenly into 24 paper-lined medium muffin cups, filling each cup 1/2 full. Bake as directed on pkg. for cupcakes. Cool. Pour 1/2 cup of the remaining coffee and the cold milk into medium bowl. (Discard any remaining coffee.) Add dry pudding mix. Beat with wire whisk 2 min. Gently stir in whipped topping; spread evenly onto cakes. Refrigerate at least 1 hour. Decorate as desired. Store leftover cakes in refrigerator. Prepare as directed, using YUBAN 100% Columbian Coffee. Makes 24 servings, 1 cake each.